Commentary: This ain't bad. The vehicle in and of itself is a fun toy with a massive - massive - wingspan at 36-inches wide when sticking out at the sides, which makes you understand why Captain Cassian Andor's vessel was downsized a bit to fit only one action figure, rather than serve as a troop deployment device. (I also assume it might have something to do with being shown the design before anyone could see the script and full functionality of the vehicle in the film or in the script, combined with how big most Rebel Fighter toys are and how much you can charge for them. But I digress.) The figure pilot is a good one - as a figure. 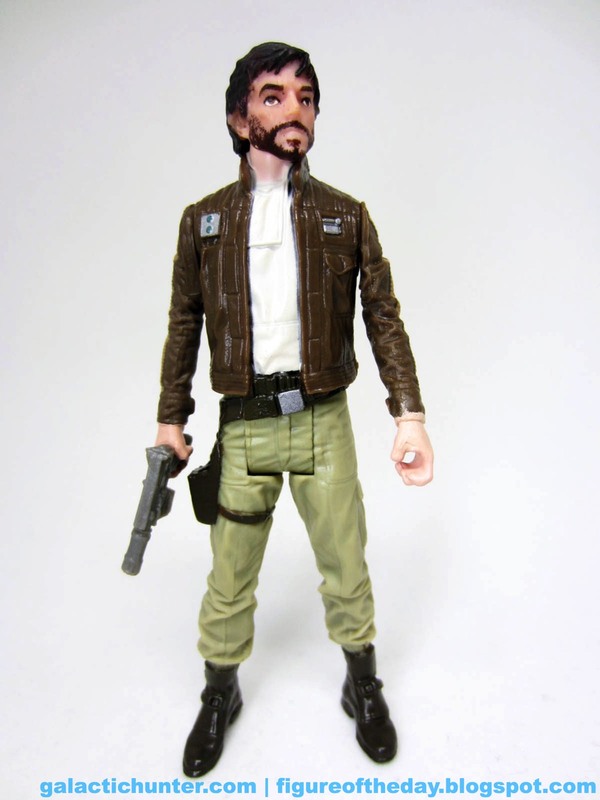 In terms of awesomeness it's not bad, but if you compare the toy head which looks a lot like a doll version of actor Diego Luna to the box photo which really looks like him, it doesn't hold up as well. If you look at it, though, with its big and wide eyes you'd probably say "Hey, it's that guy from the trailer whose name I don't know yet" or "Is that Bret McKenzie?" I kid, but it's pretty good. The hair looks good, the expression isn't bad, and the skin tone is far less pale than other figures in this line so far. Since Diego Luna isn't a pale white dude, this is a good thing - but it's not uncommon for action figures of any and every race to be slightly lighter than their real-life counterparts. 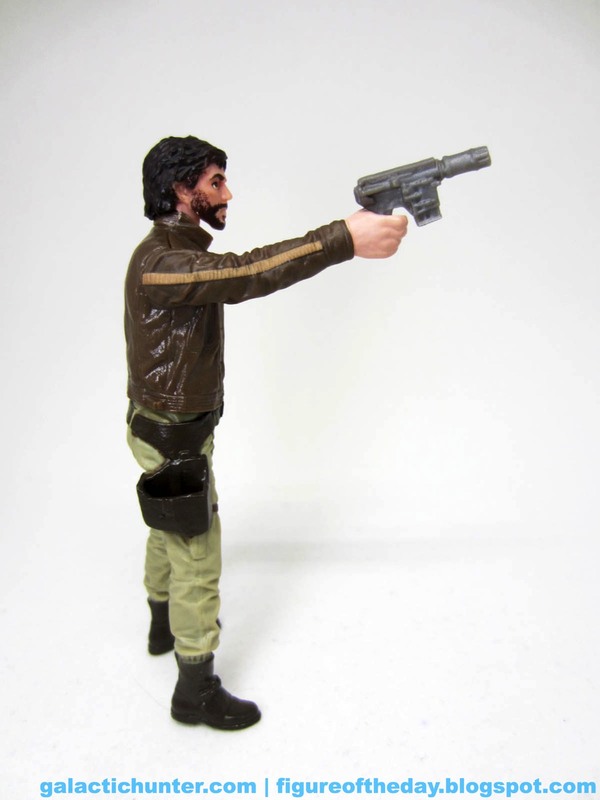 His hands have a little overspray on the wrists - unintentional shades of Kenner ca. 1980-1982 (see: Lobots) - with a great pose that's very much like those original action figures. He has a working holster and has no problems standing, sitting, or fitting in the ample seating area of this vessel. Hasbro even added an elastic seat belt to hold him in place. 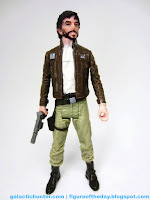 He has 5 joints, nice and skinny and perfect, giving you a nice shot at a real modern take on a "vintage" Kenner figure. Heck, I'd say that's a theme of the line - the 3 3/4-inch figures and vehicles all seem to owe a lot more to the 1980s. Cassian's jacket has a nice yellow stripe with a silver rank pin, a light brown shirt, tan pants, a working holster, and brown boots. The face has big white eyes - perhaps too big - with a brown beard that seems about as well as the factory could paint this kind of scruff at this size. In other words, it isn't perfect. It's good, though. This isn't to say it couldn't be better, but I quite like it and I love that Hasbro molded the jacket to his body rather than making it a separate, removable piece. It looks better and feels much more sturdy. I know you're already down on the ship, and odds are you're going to grouse before you buy it on sale if at all. I've found the Nerf dart launcher to be hidden away, no more obtrusive than a battery compartment cover on a vintage toy. Two rings store the darts on board, which is nice. The wings swing out nicely, as do all four kickstands for the landing skids. Assembly was kind of a pain, but it was quick with no labels to apply. The swinging wings are a little flexible, but there are "shelves" on the body to prevent them from sagging over time. Whoever designed this - my most sincere thanks for this feature. Sagging wings on X-Wings can be a problem, so seeing prevention engineered in the ship means a lot to me as a long-term toy collector. While having a cargo hold, a trooper container, or a bigger cockpit for two would be nice, vehicles have to make adjustments just to fit within the price point. I bet it could be cheaper if they left out the figure and the launcher, but you'll be glad to know Hasbro didn't skimp on the quality of the plastic. The windows are nice and clear, with the plastic looking as lovely as ever - not waxy like The Force Awakens' X-wing fighters last year. 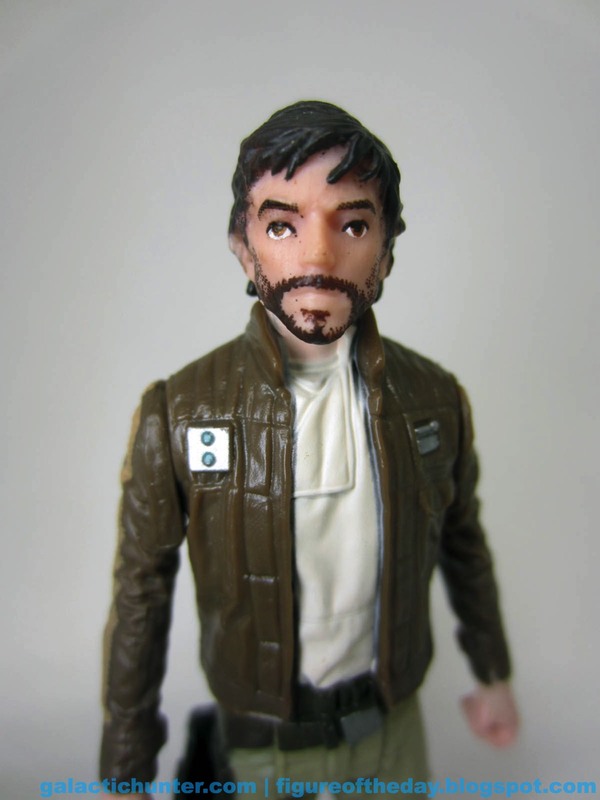 I assume fans will hope that Cassian is sold separately, because taking (what I assume is) a fairly important character and making it a pack-in with an expensive vehicle seems like a tough sell for many fans. Maybe he'll get a helmet later - or maybe this is it. Either way, it's a nice figure and I like the U-wing itself enough to say you should get it if it's on sale for $40 or less, and even at regular price it's not bad given what inflation gets you in 2016. It's good. It may not be totally accurate, but if you're a fan of toys-as-toys it's neat.